Now that college is underway, I've been working to generate interest in the Running Club. Instead of just doing some regular runs, I decided to offer a new concept to it, called the COMET Run. Comets is our nickname at the college, so I'm using the COMET acronym to lay out how the COMET Run goes. We will start out at the college and run to a nearby park. We have a city park nearby the college, plus an elementary school that isn't too far away either. We'll use the playground equipment, from benches to steps and swings and even some trees, to go through an exercise circuit as a total body workout. I wasn't sure how many would show up on Tuesday, but I had a couple new students who showed up and had a lot of fun. Today I'll be part of the Club Expo on campus to discuss it further with students. The COMET Run format is a fun little way to get back into the fitness training world again, using it as a way to get the club to grow. Pull-Ups using the Swings as our 'straps"
If you're a part of Mayville State in some way, as a student, faculty or staff member, come and join us on Tuesday and Thursday mornings at 6:30am. Oh, its also free to do! If we get more people who want to do more runs on a daily basis, we'll discuss it amongst ourselves and find out a good time to do it. I'm thinking Monday and Wednesday runs would happen at the same time, for just a general run/route to do. As for other workouts, I've been on the bikes still, just not as much as usual. Mainly going for about an hour or so on some rides. I have almost 250 miles in for the month of August, so a huge drop in mileage compared to July's. It has been nice to get in some morning runs lately though. Last weekend, I decided to sell two of my personal mountain bikes and put a few others up for sale that I've worked on as well. I sold my Schwinn OR2 hybrid bike and also let go of my Ironhorse fat bike. I was amazed how quickly they went, but it also downsized my garage a bit and created some space...for two others I ended up with. I found a home for one of those newer ones dropped off to me, and will find a home for the other. I went on a 26 miler with my buddy on Sunday night on the classic Specialized Crossroads hybrid bike I just fixed up. This bike is lighter than my previous OR2 and was sort of the impetus of making me sell my two mountain bikes. I got the bike for a steal and only had to add better tires and tubes, plus fix the shifter up front. My last ride also was my last use of the Intra mix from AdvoCare. I'll have to order some more this week. I do like the combo of either Pre or Spark before my rides, then the Intra during the ride itself. As far as weight training goes, I did some KB cleans on Sunday morning, doing 300 reps with the 40# bell and doing 1 arm cleans, 150 each side overall. Monday was a 2.5 mile run in about 20 minutes, clipping along just fine. This morning was another round of double KB cleans with the 35's, doing 150 total. I do 10 reps at the top of each minute. The rest of the week looks like some rides here/there and some runs in the morning as well. I also have a new resto project that came my way, so I'm working on restoring that ride as well. After the heavy mileages of July, I'm still feeling a little worn down and have backed off my evening and weekend riding distances. I've only put in about 50 miles this week so far. I have started running again and will try to balance out a few runs in the mornings now. With less time on the bikes, I had more time to take in some documentaries on Netflix. One interesting one was called Icarus, which was a documentary on an amateur cyclist who wanted to do a documentary on doping in cycling, doping himself in the process. He trained for a pretty serious amateur race that was about the equal to the hardest 7 days of the Tour de France, all in a row. It was an interesting look into the secretive side of cycling and doping for performance improvements and attaining elite levels. The cyclist gets in touch with an expert in Russia, who just happens to be behind a major cover-up for the Olympic athletes in Russia. It is a pretty wild documentary that goes from watching about how doping works, to how doping REALLY gets covered up. I read about this one online and really enjoyed this documentary in the end. The other documentary I watched was Betting on Zero, which covered a business investor's deep look into a nutritional supplement company, Herbalife. The deep discoveries into the business and the way it is promoted and told how to operate was a little eye-opening, but not really surprising either. The company is a multi-level marketing one, much like many, many other home-based businesses are in their structure. To many, the advantage of being an independent distributor for these businesses is to mainly get savings on the products themselves, and then also to make a small profit by selling products to retail customers. The argument goes back and forth on whether or not they are a 'pyramid scheme' business or not, in which I say yes it is, but so are many others that have similar structures of trying to recruit people to start their own at-home businesses instead of moving product. Basically the products get moved by the new recruits buying it for themselves, and not really profiting from it on their own. However their 'upline' profits from their downline's purchases. I've been a part of a few MLM companies back in my fitness training days and after my fitness training days. These companies have been Unicity (not sure if they are around, or just known as something else now), Beachbody, and Organo Gold, a coffee company. I am now a part of AdvoCare, which compared to the others, I like their structure better than the previous ones. I got started with Unicity when I moved to Ohio, but didn't really get into selling it to anyone since I was struggling with the job I had out there, plus when I moved again shortly within a year, I got focused on other things and just dropped it. Beachbody I really got into for about a good year or so, but I grew tired and weary of their ever-present forcing of buying products each month in order to 'remain' in a certain level, PLUS I would still end up paying a $15/month fee just to sell their products through a special site. I was trying to sell $120 programs and only making $30 if I ever sold anything. Programs like P90X, which were already sold in the millions, were usually available as used items for far less than I could sell it for. It seemed like everyone I talked to about it, they usually got a copy from a friend for far less anyway. Very discouraging. In the end I really got turned off by their products and what seemed like a complete arrogance about their own products. Some of the workouts are fine, but others I feel were very ill-advised and not put well together (not a fan of Insanity, sorry for those who are. Dance instructors should not be coming up with sports performance actions and calling it extreme fitness!). I ended up finding out about other programs to sell, such as ones by Craig Ballantyne that I've talked about numerous times here, which actually allows me to earn more money per sale on his programs than I would ever earn with Beachbody's methods. I decided to go with this route since a) it was free to sell as an affiliate and b) it offered better value for my readership and c) it was far less than most programs I used try to sell with BB. I also used Mike Whitfield's programs, who is a Ballantyne TT Trainer, and who also has a great, true life story of weight loss to share. Mike's and Craig's programs are innovative on their own and very affordable to sell to others who may benefit. About 4 years ago I got introduced to AdvoCare and became a distributor, adding it as an option to my training blogs and sites that I kept up after I got out of training. I never really got into selling it big time though. I heard about Organo Gold about 2 years ago, but couldn't really get that going and found it difficult to sell coffee pods that were almost $2 a K-cup, even at my 'discounted' price. The instant coffee that was the least expensive was okay, but still a hard sell in the day and age of K-cup makers. I dropped that after about a year of trying. I then realized I was still an AdvoCare distributor and looked more into its structure. I wanted a solid lineup of products to sell and they made it pretty easy to setup an at-home operation. I've posted many times about my journey after trying their 24 Day Challenge out and also other products, including the new FIT Line. The new Pre, Intra, and Post system with the FIT Line work very well together, especially Pre and Intra. Out of all 3, I feel the Intra alone is a great addition for my long 1-2 hour bike rides. The product lineup is a great fit into my active lifestyle now. Another great structure of AdvoCare is I feel it isn't 'pushy' onto customers. I always felt that I had to sell the business opp whenever I talked to potential customers of other companies I sold for. AdvoCare at least has the Preferred Customer option, which lets customers get a great discount and do it for a low cost per year with their PC Membership. You don't have to create a home business with this option and still allows you get some great savings on the products. If someone wants to get into the home business aspect of it, the incentives are there as well. Either options of being a retail, Preferred Customer, or Distributor allows anyone to experience the benefits of the products. The home business tools are great things to use if you are a Distributor, especially their programs like DebtBuster and numerous videos to watch if you are unsure how to present the products or talk about them with others on the fly. Back to the documentary: It was pretty scary how some of these companies use crazy tactics to just recruit, recruit, recruit, and seem to force new recruits to purchase thousands of dollars in products. I guess I like AdvoCare the most out of all the past ones I've done because it doesn't push people into constantly finding more and more people. I know there are some that always seem to push the opportunity before the products. I'd rather tell you about the products and see who will be a great fit for whichever opportunity exists out there for them. If you want some discounts, great, I have an option to tell you about. If you are interested in selling them for a nice at-home business, I have that option to tell you about too. For me, it pairs up well with the other stuff I sell on my blog here, such as my own Kindle guides, and other trainers products. I'm not sure about you, but for me, I'll take it as the best option I can find out there for my needs. I suggest watching both documentaries if you are interested in the enhanced performance methods discussed about in Icarus, and the eye opening info of Betting on Zero. Both are available on Netflix. The last few weeks of high mileages have wiped out my legs pretty good, as I felt the stress catching up to me on last weekend's rides with 47 total miles on Saturday & Sunday. Tuesday I went out for about 20 miles to keep it a bit lighter. Last night's rain was on and off, so I went out for just a 6 mile ride on my fastest bike, getting in a good ride all throughout town in a short time. The ride itself was a hair over 20 minutes. This felt 'just about right' for a good spin but nothing too taxing. I did try a morning run again on Tuesday morning. Wednesday morning I took it off from exercise. This morning I did a 40# kettlebell clean workout, doing sets of 10 with each arm and getting 200 total reps in under 10 minutes. I typically do 100 in 4 minutes flat, give 2 minutes rest, then finish the next 4 minutes with another 100 rep round. I also bought a new program on Sunday online, so I'm finally getting around to trying a new tonic trick that's pretty inexpensive to try out. I'll discuss it more as I give it a try and see if it does anything positive. I just bought all the ingredients yesterday, so it will take some time to implement. My AdvoCare FIT package is running low soon, so I'll look at getting more Intra packets and maybe some Pre ones too. I actually haven't taken the Post workout drinks since after my evening rides, I feel I need more calories. I feel those might do better with a morning shake routine after my morning workouts. I still have a fair amount of other shakes to drink up, so it will be a while before my Post packages run low. Overall, I still like my Spark before a ride and using one pack of Intra in my full water bottle. Two packets of Intra really helps out if I go over 20 miles on a ride it seems, but one will do just fine as I've discovered. After taking off Friday, I rode again on Saturday and Sunday for 16 on Saturday, then 31 on Sunday. Saturday's ride I was able to keep on riding, but the legs were starting to feel it after the past few weeks of piling up the mileage. Sunday's ride went about the same way, when the halfway point hit me again. I did have some Intra packs on both rides which helped me get through the rides, but I was still feeling pretty tired by the end of it. I wavered on a morning routine, but ended up doing some 1 arm kettlebell cleans. I did sets of 100 in roughly 4 minutes per set. I typically do 10 reps per side, alternating all the way to 100 for these sets. Overall, it was a 10 minute workout (4 minutes of 100 reps, 2 minutes rest, 4 minutes to finish the 2nd set). I'll see how the legs feel tonight for a ride, and if I end up going for one, it will be a short one. I feel I may have to back off the mileage this week for a change. The temps were very ideal for an evening ride, so my buddy and I went out for some gravel grinding south of town, then over to Portland and back to town again. 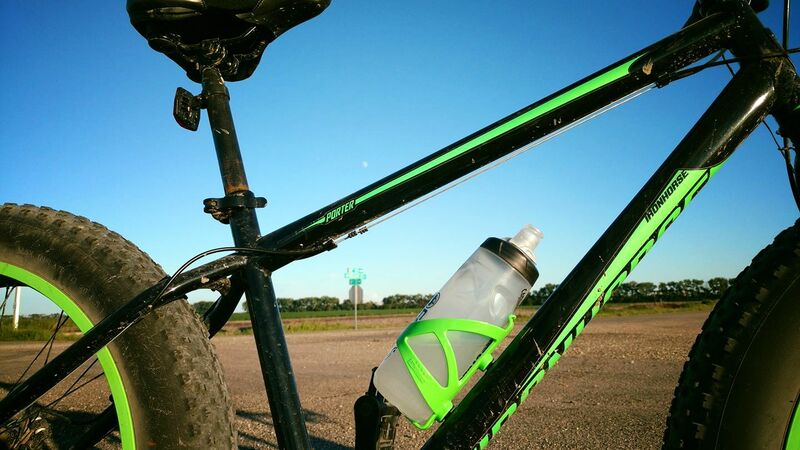 I bought a new bottle holder for my fat bike, a matching neon green one that fits the bike well in both style and function. We went for 30 miles total for the night, its funny how many creaks and stuff you hear on a bike after longer rides. Mainly my chain needs some cleaning and the entire bike needs a good cleaning as well. I tried a combo of Spark and Pre workout packets before the ride, plus used two packets in one bottle of the Intra series. They were a great combination overall to help power through a 30 mile ride and also tackle some hills on the gravel. I know the products are helping me a lot as I've added more and more miles on my daily rides at night and endure through mileages of over 100 miles a week lately. This weekend looks great for more riding and great temps too, maybe I'll get in some super long rides as a result. Yesterday was a morning run, followed by an evening ride for 22 miles. Once again, the Pre and Intra drinks are working out great for long distance rides for me. Even if you're already having a post-workout shake as a part of your diet, the Pre and Intra packets can be bought separately and added to your plan. If you enjoy long rides or endure some long bouts of exercise in the gym for an hour or so, the Intra series from the FIT lineup is worth looking into. This morning called for a 15 minute session of Kettlebell double cleans with a pair of 35's. I did 10 reps per set for 10 minutes, 10 at the top of each minute. I then finished it with 2 sets of 20, doing a set of 20 every 2, and finishing with a set of 10 to complete the workout in under 15 minutes. It was basically a 1:1 work/rest pattern, getting 10 reps in about 30 seconds, then resting for 30. Any time you're looking at work capacity, using a 1:1 work/rest pattern is a great way to get a workout in during a short period of time and also getting plenty of work done in that time. Tonight, I'll see how the weather holds up. Looks like rain is possibly on the way, but if it lightens up, a ride might be in order. Last week was another huge round of riding, as I finished off the week with rides on Thursday, Friday & Saturday, taking Sunday off. I clipped off another 23 last night with my buddy to get 424 for a total mileage in the month of July. I really kicked things up the last 3 weeks with getting more than 100, then 117, then 109 in about a 3 week period alone. Never have I tried such a thing, but it was both exciting and eye-opening. Before I'd do some 20-30 mile rides but not too many on back to back rides or a series of consecutive nights. It was also a great test for the Pre, Intra, and Post workout drinks that I use in the AdvoCare FIT system that I'm going through. The biggest eye-opening night was a 30 mile ride done in 1:45 for time, averaging about 17mph on the bike over that time frame. I was able to keep a great speed going and was able to power through some tough efforts of wind and heat. This morning I tried a return to running again, doing 2 miles in about 14:45 in an interval workout. Remaining time was hard effort to finish out to 2 miles. My foot feels okay, it was just the right mileage to begin with again after a layoff of running and boost in cycling. The week is off to a good start!